The year 2018 was a very rich one with the completion of the EN9100 transition and the engagement of the experts’ working groups on methodologies aiming to develop best practices and fine-tune the reference tools. As the year begins, QUALIFAS is already bubbling with excitement and is actively pursuing the construction of its action plans to help its teams, programmes and processes advance within the stipulated lead-times. And let’s not forget its communication efforts with its new website https://www.qualifas.com, bringing it into line with the General Data Protection Regulation (GDPR), and the strengthening of its partnership with SPACE for putting the APQP training modules in place for SMEs. So many exciting projects to ensure each member company feels motivated to contribute to our pooling initiatives, for the good of the Franco-Belgian Aeronautics, Space and Defence industry as a whole! 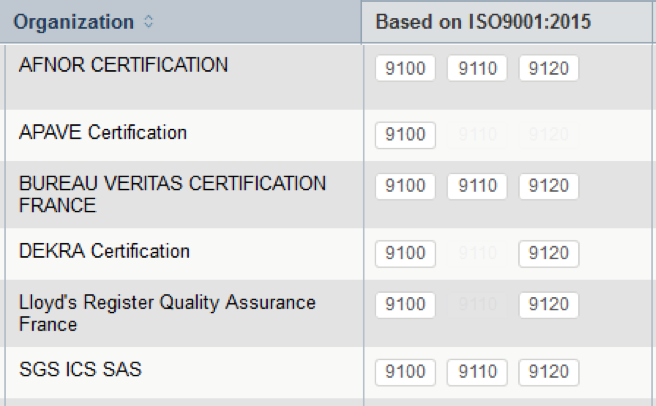 EN9100 certification is becoming the inescapable route for accessing the ASD market, and even for maintaining a presence on that market. This is a worldwide scheme leading to recognition of the certified companies by a referencing in the “Oasis” international database, certifying the reliability and quality of the services they provide. QUALIFAS contributes to ensuring the reliability of this certification scheme by encouraging its members’ eligible suppliers to seek certification. Eligibility is defined on the basis of criteria recommended by the Association. 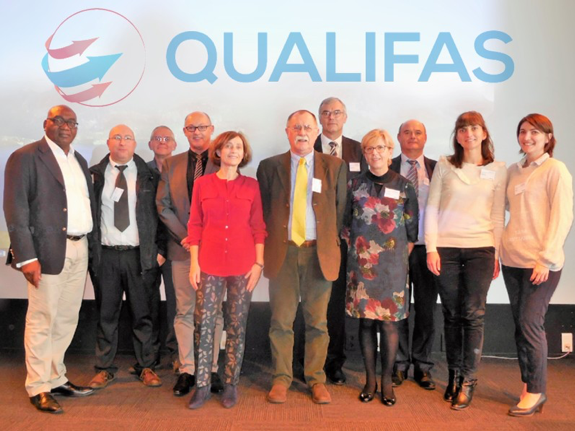 QUALIFAS is assisted in its approach by the Occitanie Chamber of Commerce & Industry, which helps SMEs/microenterprises working in the ASD sector to obtain EN9100 & 9110 certification by giving them technical and financial support. Last places available to be seized at the beginning of 2019! Three months after the Transition (in compliance with ISO9001:2015), 99.9% of the active sites have successively made the Transition (worldwide). A significant increase (+17%) in the number of active sites certified in the OASIS database was recorded during the reference period from March 2017 to September 2018. The Transition, which was implemented on 21 March 2017, with 19,232 active sites referenced, really encouraged the companies to enter into the certification process with 22,558 certified sites listed on 15 September 2018, the official end-of-Transition date. We can therefore consider that this Transition was a real success, both on the worldwide and French levels! In order to meet the need relative to the increased number of sites to be certified, the French CBMC (Certification Body Management Committee) recognised two new certification bodies, APAVE Certification and DEKRA Certification which have joined the ICOP (Industry Controlled Other Party) scheme. To date, six French organisations have been accredited for certifying and renewing companies. In parallel, the French AAB (Auditor Authentication Body) committee has organised itself for authenticating / renewing a sufficient number of third-party auditors, in line with the new version of the standard, to allow the certifying bodies to accomplish their mission. From December 2016 to December 2018, 100 % of the panel of auditors was renewed in compliance with the new baselines (worldwide). The QUALIFAS CBMC and AAB organised a training day on 30 November 2018, essentially for the third-party auditors dedicated to the EN91xx certification of the ASD sector’s supply chain. This event brought together around one hundred people on the AIRBUS Blagnac site: third-party auditors, representatives of the French certification bodies, COFRAC technical assessors as well as industry assessors (third-party assessors) who all contribute to monitoring and ensuring compliance with the IAQG (International Aerospace Quality Group) international requirements. This biennial day provided the opportunity to obtain feedback from the field on the EN9100 Transition and the issues encountered by the various players who have deployed it. On the subject of “goals and aims for industrial companies”, AIRBUS was given the opportunity to discuss not only its obligations in the framework of a single POA (Production Organisation Approval), but also its expectations. On the practical side, a demonstration of the OASIS tool was given by an international expert. Detailed assessment of the Transition, clarifications regarding the new requirements, feedback on the nonconformities detected in the framework of the monitoring programme, requirements and best practices for the Auditor Authentication Body and, lastly, future developments around EN91xx. In the framework of the Supply Chain optimisation mission and in line with its associative mode of operation, QUALIFAS deploys Working Groups (WG), on subjects of mutual interest. The WGs, comprising representatives of the members, work on subjects identified by QUALIFAS, or initiated by the GIFAS Quality Committee. The Scorecard was born from the works of a WG in 2015. 2016 saw the launch and success of the WG addressing supplier eligibility criteria for EN9100 certifications; the deliverable was presented in the form of a “QUALIFAS Recommendation”, that the Members have been able to appropriate and integrate into their own Quality and Supply Chain Management System. The results were greatly appreciated! The “WG” approach will be pursued in 2019 for the WGs that have already been launched: “Requirements for the design and deployment of shared requirements” and “APQP training modules”. They will capitalise all the supplier requirements common to the Community as a whole. By construction, these common requirements will be complementary to the requirements of the ISO, EN and AQAP standards. The CGR must be structured in the same way as the SCMH. There are two possibilities: either the QUALIFAS-member company recognises the SGR/CGR system, or it applies it. A specification has just seen the light of day, whose main goal is to define the principles adopted for the design, development, communication, implementation and upholding of the “SGR_CGR_SR”. The solution will have to be portable via advanced technologies and make it possible to capitalise, record/archive supplier data, answers and commitments as well as their level of compliance with the CGRs, including any deviations. The goal is to improve the competence of the QUALIFAS members regarding APQP by sharing skills, know-how and experience, to standardise the approach and allow the SME network to benefit from these works, in collaboration with Space. The Group is working on the design of training material for each module, which will then have to be validated by the instructors who will have to conduct test sessions on the basis of a half-theoretical (vs SCMH) / half-practical test day, with concrete examples of deployment. Two courses have already successfully been deployed at QUALIFAS: APQP Level 1 and APQP Phase Planning. A third theme, SR/CI/KC (Special Requirements / Critical Items / Key Characteristics), considered to be a priority, is in its finalisation phase. It will be tested and deployed in mid-2019. Other themes will be developed with respect to the elements of the APQP. Further to accreditation on 9th August 2018 by COFRAC, and on behalf of the French aeronautical, space and defence industries, and after validation by its representatives, the French CBMC has recognised DEKRA Certification’s accreditation with respect to the 9100 & 9120 standard based on ISO9001:2015. From now on, the services performed will therefore be recognised at the IAQG (International Aerospace Quality Group) level. Continued recognition within the ICOP (Industry Controlled Other Party) scheme is subject to compliance with the requirements of the standards in the EN9104 series. Currently being redrafted by the IAQG international group. The revision began in 2018 with the ambitious goal of writing a “coordination draft” for July 2019, and a target publication date in mid-2020. We will keep you informed of the interesting changes related to this revision in a later issue. 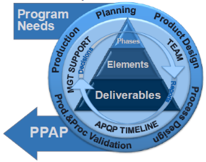 Requirements applicable to the Quality Management System in the Aerospace sector (SMQA). Currently being redrafted by the IAQG international group. The revision began in 2018 with a view to redefining the auditor training and qualification criteria, in line with the changes made to 9104-01. Publication target date: end of 2020.